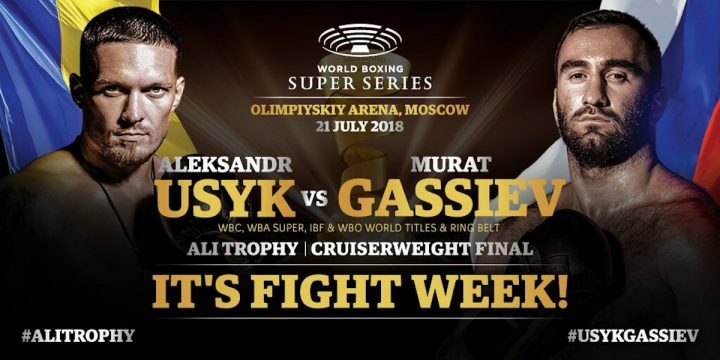 By Jim Dower: Unless something changes by Saturday, U.S fans won’t be able to see the World Boxing Super Series finals fight between cruiserweight champions Murat Gassiev (26-0, 19 KOs) and Oleksandr Usyk in Moscow, Russia. According to Dan Rafael, the Gassiev-Usyk fight still doesn’t have an American broadcast outlet that will be showing it to U.S boxing fans. Usyk and Gassiev arrived in Moscow, Russia earlier on Monday to get ready for their cruiserweight finals for the Ali Trophy at the Olympic Sports Complex. Usyk, 31, was a clear favorite to beat Gassiev until recently. Usyk didn’t look great in beating Mairis Briedis in his semifinals fight in the World Boxing Super Series last January. Usyk got the win by a 12 round majority decision, but only beat Briedis faded in the last four rounds from the 9th to 12th. The 24-year-old Gassiev is a different type of fighter. He doesn’t fade late in his fights. He gets stronger, and he’s very good at applying pressure on his opponents. That’s bad news for Usyk, because he’s going to need to take a lot of heavy shots from Gassiev for him to win the fight. Briedis was getting the better of Usyk through the first eight rounds with the pressure that he was applying. Usyk was able to increase the pace at the end to squeak out a decision. While training for the rematch with Gassiev, Usyk suffered an elbow injury training that required their previously scheduled May 11th fight in Jeddah, Saudi Arabia to be postponed. The fight was then moved from Jeddah to Moscow, Russia. Gassiev, 24, has the advantage over the 31-year-old Usyk, so it’s not surprising that he’s flexible and able to acclimate quickly. Gassiev trains with Abel Sanchez at Big Bear, California. The 6’3” Gassiev has gone through a tough training camp and he’ll be ready for whatever the 2012 Olympic gold medalist Usyk brings on Saturday night. Gassiev recently defeated WBA cruiserweight champion Yunier Dorticos by a 12th round knockout in a war in their semifinals match on February 3 in Adler, Russia. Gassiev came on late in the fight in hurting Dorticos in the 11th round and hen finally taking him out in the 12th. At the time of the stoppage, Gassiev was barely ahead by the scores 105-104, 106-103 and 106-103. After Saturday night the cruiserweight division will briefly have one champion that holds all four belts. The Usyk vs. Gassiev winner will have not only the IBF, WBA, WBC and WBO cruiserweight titles, they’ll also hold The Ring cruiserweight title. Unfortunately, the titles won’t be unified for long, as Usyk and Gassiev both plan on moving up in weight to heavyweight to go after world titles in that weight class. There’s a possibility that the winner of the Gassiev vs. Usyk fight might stick around the cruiserweight division long enough to defend the four times against former World Boxing Council champion Tony Bellew. That would depend on whether Bellew’s promoter Eddie Hearn can entice the Gassiev-Usyk winner to face him rather than moving up to heavyweight to go after a world title fight against champion Anthony Joshua. “I am looking forward to the final. A final that will bring out the best in boxing. I can’t wait to see my fans in Moscow,” said Usyk. The boxing fans at ringside will likely favor the Russian Gassiev on Saturday. However, there will be enough of Usyk’s own fans to where he’ll receive some support. Usyk fights well on the road. He’s not someone that is dependent on fan applause for him to do well in his fights. Gassiev can’t let Usyk build up a big lead in the early rounds like he did with his last fight against Dorticos. Gassiev was way too passive in the early going against Dorticos for his own good. Gassiev got away with him giving the early rounds because he was facing an aggressive come forward type of fighter. Usyk is a different case. He likes to box and move, especially when builds up a big lead in his fights. If Usyk is able to get away ahead on the scorecards in the first six rounds, he’ll likely instinctively milk his lead by staying on the move and not letting Gassiev get near him to land his big bombs. Out of practicality, Usyk will be a lot more defensive against Gassiev than he normally is due to the size, youth and punching power of the Russian fighter. Usyk doesn’t have the kind of punching power that would enable him to go to war in the trenches against Gassiev. With the kind of power that Gassiev has, Usyk isn’t going to want to let him test his chin or his ability to take body shots. ”‘Winner takes it all’ frase has never been more fitting. On Saturday in Moscow boxing and the world of sport will have a new, true superstar!” promoter Kalle Sauerland said. With the fight not being televised in the U.S, the winner of the Usyk vs. Gassiev fight might become a star outside of the United States, but not in America. It’s going to require that the U.S broadcaster’s start televising their fights on a frequent basis. This was obviously a missed opportunity for Gassiev and Usyk to get a big career boost in the U.S if their World Boxing Super Series tournament head been televised in that country. Perhaps if the WBSS tournament comes to the heavyweight division in the future, Gassiev and Usyk can sign up for it and hope that the U.S broadcasters televise it. Unfortunately, it’s unlikely the top heavyweights Joshua and Deontay Wilder would ever agree to enter the WBSS tournament. They don’t need it for them to become popular.